You strive to live a clean life – incorporating organic choices into your life and avoiding toxins whenever possible. You’ve even printed out the EWG 2011 Shoppers Guide to Pesticides in Produce and carry it with you to the supermarket. But do you ever think about the tap water you may ingest daily, the non-filtered ice cubes you consume with your to-go beverages or the water you bath in daily? What does water have to do with living a clean life? Everything, actually. Water is one of the substances required for survival. Water makes up approximately 60 percent of our body weight. One of the most important functions of water in your body is to flush out toxins and salt. In fact, eight glasses of purified water a day will aid your body’s ability to properly digest, transport nutrients, remove toxins and waste, lubricate joints, and improve overall immune function. You may be aware by now that tap water is not the answer because of the sediment, bacteria, heavy metals, chlorine, odor and other contaminants present in the majority of municipal water supplies. Fast forward to bottled water. After all, it’s filtered, right? Think again! According to an extensive study by NRDC (National Resource Defense Council) 40 percent of all bottled water proved to be just plain old tap water. Your home’s tap water might appear clear and may even taste good, but don’t be fooled by a wolf in sheep’s clothing when it comes to tap water. 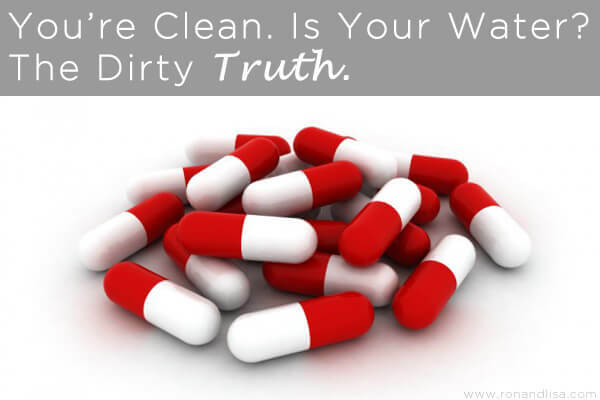 While your local government water agency may deem your tap water safe, the list of contaminants they test for is surprisingly short; the most alarming of which is pharmaceutical drugs as recently confirmed by independent testing across the United States. You can view the attached map to see if your city is affected and if you are one of 46 million Americans are affected by trace concentrations of pharmaceutical drugs in their water. And yes, you read that correctly. You might be wondering how these pharmaceutical drugs get into our drinking water. Consumers are responsible for the majority of this via trash disposal, flushing them down them down the toilet and unmetabolized drugs that are excreted by the body via urine. Hospitals and healthcare facilities are also to blame; an estimated of 250 million pounds of unused drugs disposed of each year! This is affecting not only our health, but the health of our precious wildlife too. If you are in a position of requiring medication currently, then take responsibility as there are safe ways to dispose of unused medications. Also, be sure to protect your health by insuring you and your loved ones are drinking clean water by incorporating a home water filtration system in your house. Bottled water can costs hundreds and even thousands of times more per gallon than tap water. Save money and your health with a home filtration system. Lisa & Ron’s Healthy Rx:Take back our water’s health by engaging in pharmaceutical take back programs. These offer locations for the public to bring unused drugs to a central location for proper disposal. Many pharmacies also offer this solution. But, drinking water is not the only cause of concern when it comes to water. Did you know that the President’s Cancer Panel recommended installing both drinking water and shower water filters as one of the most important things you can do to protect yourself from developing cancer? While the ideal situation is a whole house water filtration system to effectively filter all the water coming into the home, also referred to as ‘point of entry’ filtration, many people don’t have this luxury if they are living in an apartment, condo or shared living space. For the budget conscious consumer looking for a method to filter their bathing water, an investment in a shower filter is a wise choice from not only a budgetary perspective, but also a health perspective. Click HERE to discover the Top Ten Reasons to Use a Shower Filter; including the fact that you can absorb 100 times more chlorine in a 10-minute shower than from drinking a gallon of the same water. Eat (organic). Drink (filtered water). And, be merry! Wow! This is a wonderful post. And how the post end is really cool. Eat (organic). Drink (filtered water). And, be merry! Great combination! LOL! Thanks Jane. Happy (and healthy) holidays.